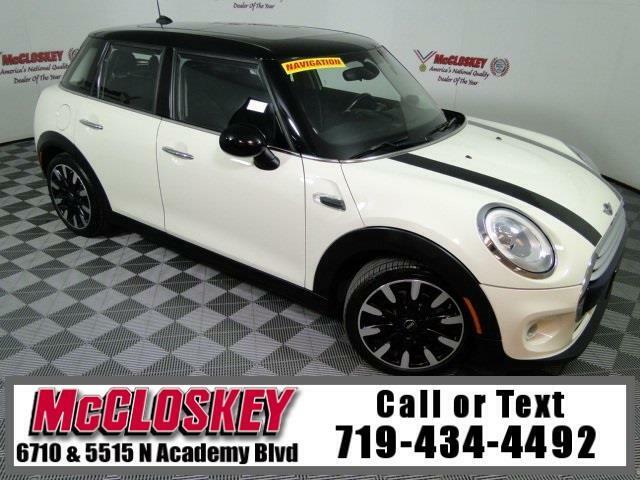 Well-equipped and sporty 2015 Mini Cooper with Sport and Premium Package, Navigation System, Panoramic Moon Roof, Keyless Entry and Ignition, and Dual Hood Stripes! The base Mini Cooper hatchback comes with a turbocharged 1.5-liter three-cylinder engine that makes an impressive 134 hp and 162 pound-feet of torque. All versions of the 2015 Mini Cooper have an engaging personality thanks to their eager responses to driver inputs. The six-speed manual transmission includes a remarkably precise shifter and an easy clutch. This vehicle passed our 110 multi-point inspection and is backed by our National Quality Dealer of the Year Award. We are an ''A+'' Better Business Bureau Rated Business. We offer low interest rate financing, low down payments and the highest trade allowances in the state! Here at McCloskey we do things a bit differently, we shop our competition every day to ensure a great value to you. Come on down and experience it for yourself. This McCloskey Assured vehicle includes a 2 month/2000 mile Warranty and a Vehicle History Report!! At McCloskey we strive to provide ASSURANCE, TRUST, VALUE AND QUALITY! Call 719-434-4492. Message: Thought you might be interested in this 2015 MINI Cooper.